Influenza is a viral infection of the upper respiratory system, which includes the nose, bronchial tubes, and lungs. Influenza can make people of any age ill. Although most people, including children, are ill with influenza for less than a week, some have a much more serious illness and may need to be hospitalized. Influenza may also lead to pneumonia or death. Influenza types A and B are responsible for epidemics of respiratory illness that occur almost every winter and often lead to increased rates of hospitalization and death. Public health efforts to control the impact of influenza focus on types A and B. Influenza viruses continually mutate, which helps the virus to evade the immune system of both children and adults. Image: The BinaxNOW Influenza A & B Card 2 and Digival reader (Photo courtesy of Abbott). An in vitro immunochromatographic assay for the qualitative detection of influenza A and B nucleoprotein antigens in nasopharyngeal (NP) swab and nasal swab samples have now been made available. The reformulated test has been granted waived status under the Clinical Laboratory Improvements Amendments by the US Food and Drug Administration (FDA, Silver Springs, MD, USA) for use with a diagnostic reader, for the rapid detection of influenza virus. The BinaxNOW Influenza A & B Card 2 (Abbott, Chicago, IL, USA) is available for use in hospital laboratories, emergency rooms, physician offices, walk-in clinics and urgent care centers throughout the USA. 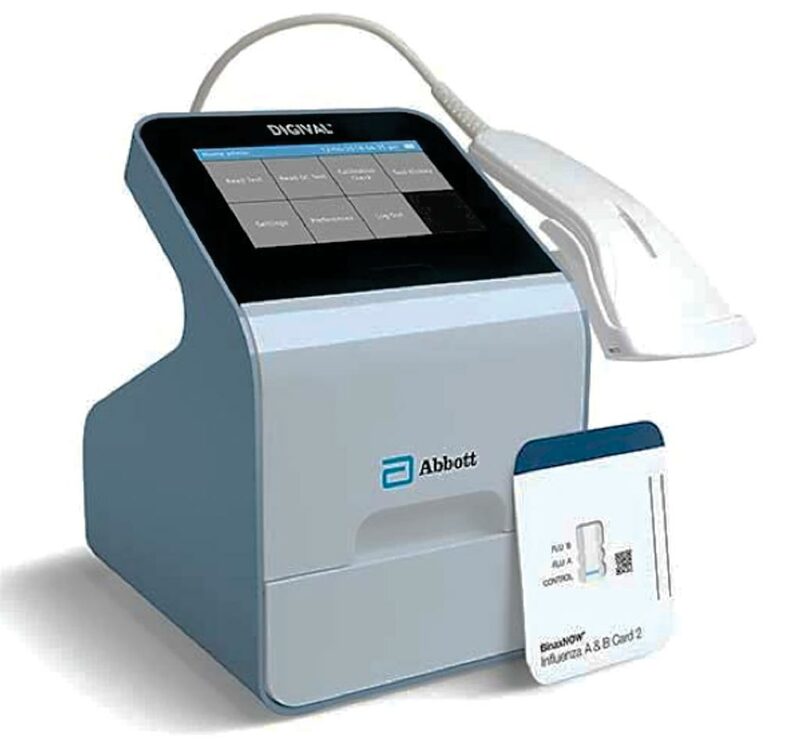 The Digival reader accurately reads and interprets BinaxNOW Influenza A & B Card 2 tests in seconds, delivering automated, objective results in a broad range of healthcare settings.